And they’re off! 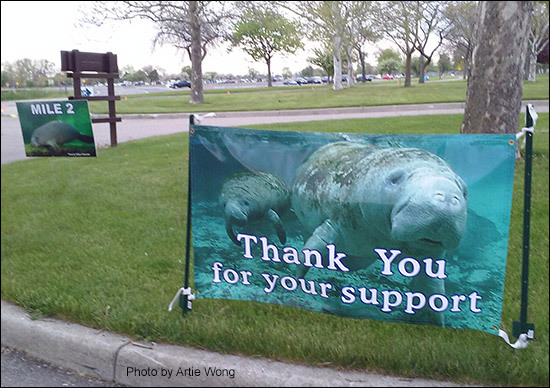 The 13th Annual Save the Manatee 5K Run was held on May 21st at the Lake St. Clair Metropark in Harrison Township, Michigan. A Virtual Race also allowed runners across the U.S. and around the world to participate. It was a beautiful morning in mid-May again and time for the 13th Annual Save the Manatee 5K Run, 2 Mile Walk and Mini-Manatee-Mile at Lake St. Clair Metropark in Harrison Township, Michigan. This year, 1,200 men, women, children and their canine pals came out to participate. 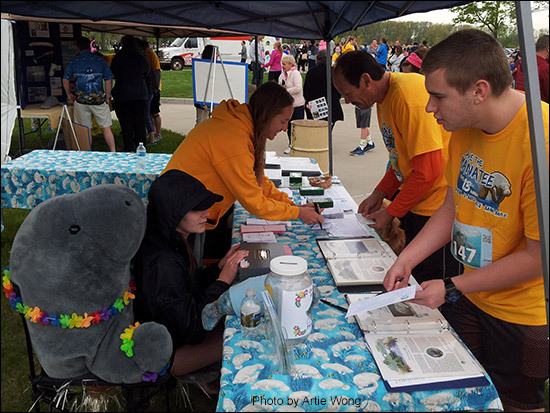 The popular race, hosted each year by L’Anse Creuse High School biology teacher Lesley Argiri and her husband Brian McDonald, helps raise funds for Save the Manatee Club’s numerous conservation efforts. To date, the race has raised over $116,000 since 2003. Race Director Lesley Argiri gives a big hug to the 5K manatee mascot. All Manatee 5K Race participants receive a unique T-shirt, beautiful finisher medals (including medals for the pooches! ), as well as a bag with discount coupons and other goodies. Save the Manatee Club had an education table at the race and signed up an incredible 47 new members for their Adopt-A-Manatee program, which helps fund public awareness and education programs; manatee research, rescue, and rehabilitation efforts; and advocacy and legal action to ensure better protection for endangered manatees and their aquatic habitat. Each person who adopted a manatee at the $35 level automatically received a free race registration for next year’s race. In addition, Joel Darling from the Darling Cetacean Society partnered with Save the Manatee Club on a manatee game where players matched manatees based on their scar patterns. “Hope,” the Club’s gigantic inflatable manatee, was once again popular with the crowds, and for the first time ever, the event was livestreamed over the Internet via Save the Manatee Club’s new Livestream channel. Attendees at the race are noticably enthusiastic about the 5K event. “My days of running marathons are far behind me, but I still enjoy running and entering 5K races,” said race participant Diane Dunn. “As an older runner, I only enter races that have most of the things on my ‘wish list.’ The Save the Manatee 5K had EVERYTHING on my list!” It is also heart-warming to witness Lesley and Brian’s tireless efforts on behalf of the manatees. Halfway through the event, Lesley walked up to the manatee adoption table in tears. “I just feel so overwhelmed. I can’t believe how much this race has grown over the past 13 years,” she said. Many runners also signed up for the Virtual Manatee 5K. This is the second year of the Virtual 5K, which allows people from around the world to run, walk, swim or kayak the Manatee 5K Race on their own time. Almost 800 participants signed up, including participants from all 50 U.S. states as well as nine foreign countries. “I signed up right away. 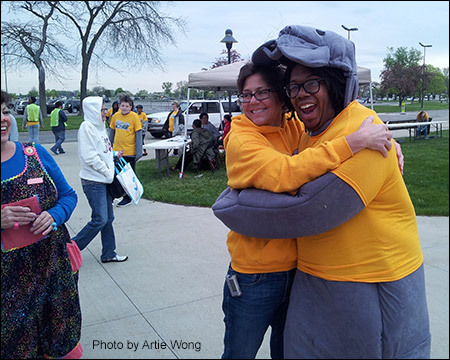 It was awesome that I could help out by simply adding an extra mile to my routine nightly walk and it was all for the manatees,” says Julie Steele, who walked her Virtual 5K in Alabama. To register early for next year’s race on May 20th, 2017, email Lesley Argiri at largiri1@hotmail.com. Save the Manatee Club’s Cora Berchem (at left in gold) answers questions about manatees and the Adopt-A-Manatee program. 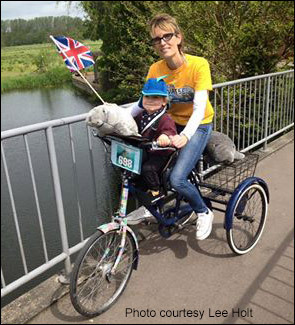 Above, Lee Holt rides for manatees in England. This year, nearly 800 people in every U.S. state and nine countries participated in the Virtual 5K. 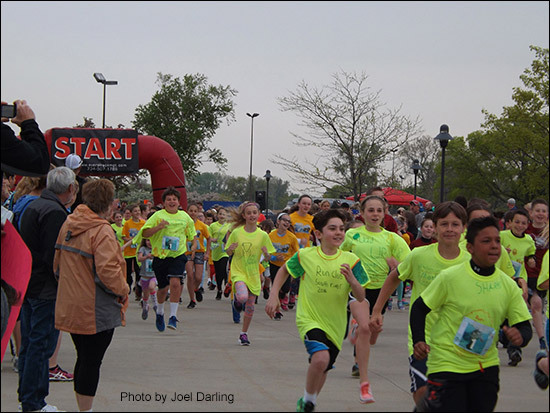 The popular race, hosted each year by L’Anse Creuse High School biology teacher Lesley Argiri and her husband Brian McDonald, helps raise funds for Save the Manatee Club’s numerous conservation efforts. To date, the race has raised over $116,000 since 2003. Email Lesley Argiri at largiri1@hotmail.com to register for next year’s 5K on May 20, 2017, or for the Virtual Run.